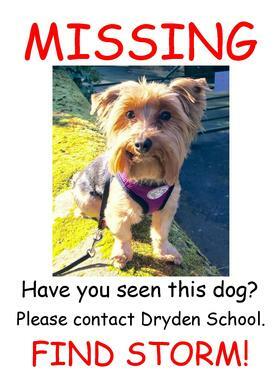 Everyone in school felt sad when they saw the posters of Miss McHugh’s missing dog when they arrived in school on Wednesday morning. We had a whole school assembly when Miss Pickering told us about Storm going missing. She told us that Miss McHugh had brought Storm into school on the Tuesday afternoon to prepare some work for Science Day. She had left Storm in the cupboard in Post 16 to keep her safe until the end of the day but when she went back to get her, Storm wasn’t there. Miss McHugh was very worried about Storm and looked for her all night but couldn’t find her anywhere. Miss McHugh thought there were six different people in school who might have taken Storm so asked the pupils in school to help find out who had her. The six suspects were Miss Goodwin, Miss Batey, Mrs Robson, Miss Daglish, Mrs McBryde and Mrs Bannister. We hoped that we would find some clues to find out where Storm was and bring her back home. There were a list of suspects in school and we had to find out who took Storm! The first suspect was Gwen the cook. 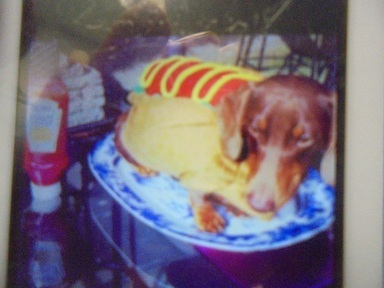 We knew she had a picture of her dog dressed up! We found 2 pieces of evidence of the weekly menu and the recipe for hot dogs. There was no Storm in it and we knew she had not used the right ingredients! We interviewed Gwen and she said she was upset someone had thought she had taken Storm! 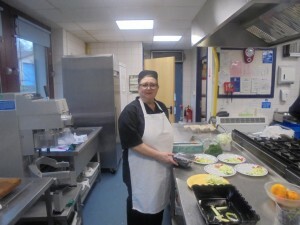 She said all her food was lovely and the children always enjoyed it! Our team all agreed! Nathan, Lewis and Chris reporting for BBC News. The second piece of evidence we had to help us find who had stolen Miss McHugh’s dog Storm was information from Mrs Coulson. She told us that although she hadn’t been in school all day on the Tuesday, she had come back in the afternoon and knew who was in school when Storm went missing. She told us the last time anyone saw Storm was at 3.45pm. 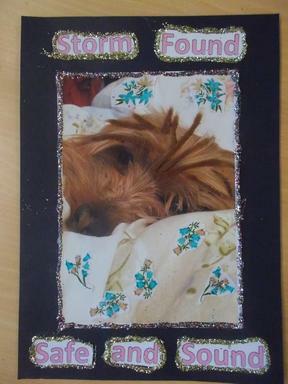 She knew that Mrs Bannister had left school at 2 o’clock so it definitely couldn’t have been her who took Storm. 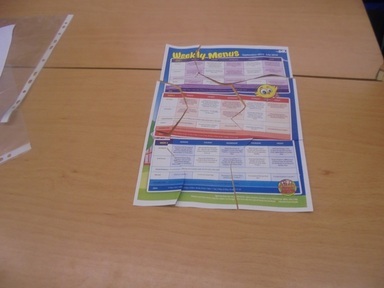 Miss Batey had left school at 3.30pm so with this evidence we could eliminate her as a suspect in our investigation. It was strange that Mrs Robson was seen in the office at 3.30pm but no one saw her leave. 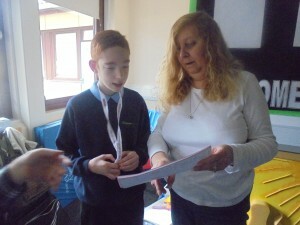 Mrs Coulson saw all of the other suspects in school after this time and Miss McHugh found Storm was missing at 4.45pm. Class 1: Did you know that Storm went missing? Mrs Coulson: Yes I did, I knew all about it! C1: Did you look for Storm? LC: I looked everywhere, but I couldn’t find Storm. I looked in my desk, drawers- even in the bin! C1: Who did you think stole Storm? LC: I thought from the very beginning that it was Mrs Robson- she looks the type! C1: Where were you when Storm went missing? LC: I had been to Hilltop and nearly everyone had gone when I came back. I said hello to people still in school but I don’t know exactly when she went missing so not sure where I was. C1: Is Mrs Robson going to get a consequence for taking Storm away? 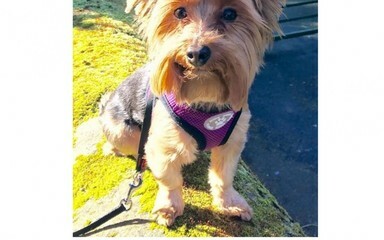 C1: How would you feel if your dog went missing? LC: I would feel sad and very worried. C1: How do you think Miss McHugh feels now Storm is back? LC: I think Miss McHugh might be very very happy to have Storm back but I don’t think she will be very happy with Mrs Robson as she is her friend and friends shouldn’t steal! Our next clue was brought to us by Christine in the office who told us she’d received an unusual fax. 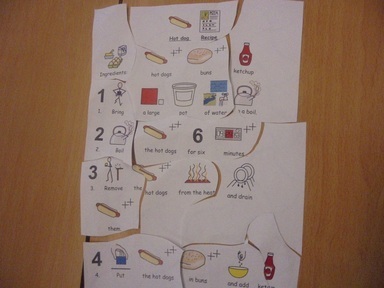 It was hard to work out what we had to do with it because all we could see was funny shapes and numbers. 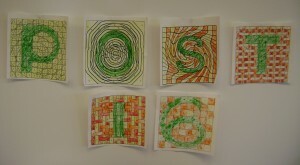 Class 4 decided it would be a good idea to colour the numbers in. Francesca coloured in the number 1s in yellow, Jacob coloured in the number 2s in green, Emily coloured in the number 3s in orange and Amy and Anna coloured in the number 4s in red. There were 6 pieces of paper we coloured in and each one revealed a letter or a number. All together we worked out the message said ‘Post 16’. 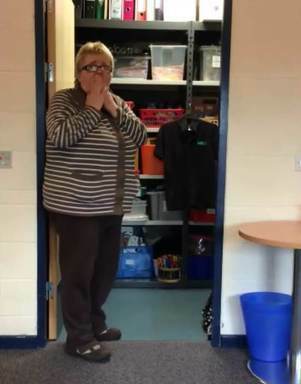 That meant we could eliminate Miss Daglish from our investigation because she was the only one of the 4 suspects left who doesn’t work in Post 16. Our fourth clue was brought was found by lunchtime staff. 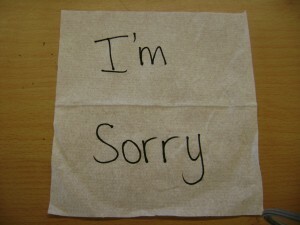 It was a note which said ‘I’m sorry’. Luckily we had information about our remaining suspects and the pens they had the day before so we could work out which pen was used to write the note using chromatography. This meant we could eliminate Mrs McBryde from our investigation as she had a different pen with her than the one used to write the note. Our last piece of evidence was a footprint in some sand. 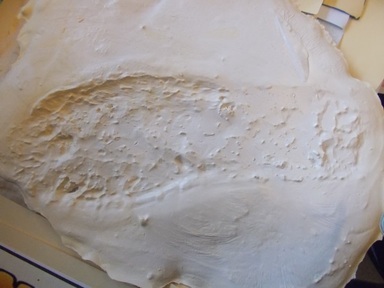 We used plaster of paris to make a mould of the footprint so we could find out who the culprit was. 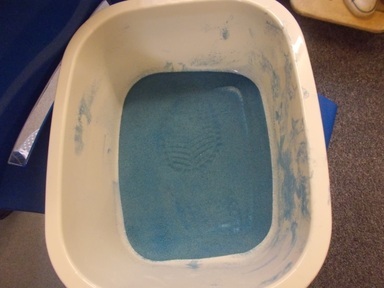 We mixed the plaster and poured it over the sand then waited for it to dry then we had a clear impression of the culprit’s shoe. 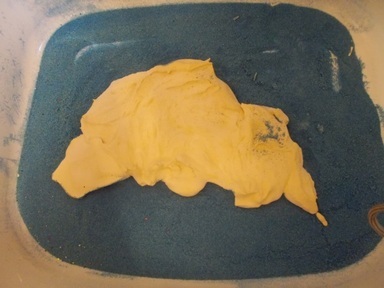 We then compared the mould to photographs of the two suspect’s shoes. This is how we discovered that it was Mrs Robson who had kidnapped Storm. We are pleased that Storm is home safe now. After Storm was found we made a poster letting our friends know that Storm was safe. We also enjoyed making plaster imprints of our own shoes. We explored what the plaster looked and smelled like and enjoyed putting our feet in it. Class 2 interviewed the culprit Mrs Robson to find out why she dognapped Storm from Miss McHugh. Ben: Why did you take Storm? Mrs Robson: I took Storm because my dog Lola is naughty and doesn’t behave and I wanted Storm to teach her to be good. Ben: Where did you take Storm? Mrs Robson: I took her to my house. Ben: Why did you write a sorry letter? Mrs Robson: I thought Miss McHugh already knew that I had storm. Ben: Will you do it again? Ben: Is there anything else you want to say? Mrs Robson: Sorry, but I only borrowed her. Mrs Robson said she was sorry, we think this is true. However, why would Mrs Robson write a sorry letter and not give Storm straight back to Mrs McHugh when she knew she was missing? John asked Miss McHugh to tell him what had happened on the Tuesday Storm went missing. 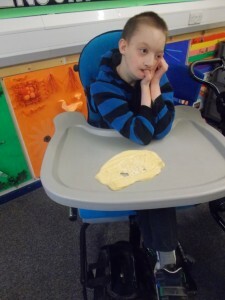 Miss McHugh said she had brought Storm into school to visit the classes and it was lunchtime. She knew she couldn’t take Storm into the dining hall or staffroom when people were eating so thought she’d better keep her safe in the cupboard. John asked why did Miss McHugh put Storm in a cupboard? Miss McHugh said she’d left the light on, it was warm and she closed the door so Storm would be safe there. John asked “What did you think when Storm had gone?” Miss McHugh said “At first I thought she must have run out of the cupboard because someone had opened the door. I went out to look for her and when I couldn’t find her I put up posters with my telephone number on. Then I thought someone must have taken her. John thanked Miss McHugh for her time. Well done to all the students for finding Storm and making sure she was safe and back in the care of Miss McHugh! If you are sad or worried about anything that has happened while you have been on the internet, TELL AN ADULT. They can help you report this by clicking on the CEOP button below.